Rocky BIS again!!! I must be DREAMING!!! The second last show for the year was hold in Växjö, it was about 4300 dogs entered. 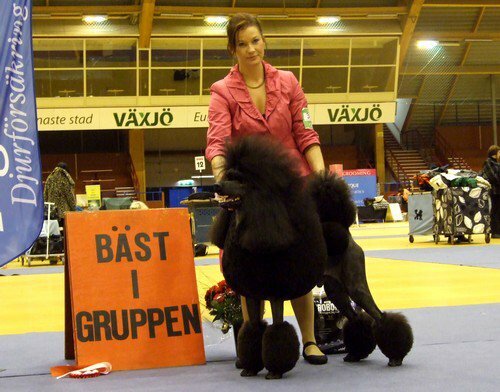 Mrs Anki Johansson did the Standard Poodles, Mrs Mona Selbach did the Group 9 and Mr Joo Shepers did the BIS final. It is getting close to the end of the year and the final for who will end up Dog of The Year in Sweden! Rocky got the breed and I didnt know anything about the groupjudge at all. Very nervousing! Anyhow we made it to the BIS final! Thanks to the judges. I stayed with my mother and Peter left with the girls to Denmark to show the youngsters. On Sunday Mr Joo Shepers did the BIS final and that was also very nervous, he put Rocky BOS in May this year so I didnt know what to expect. Rocky showed great in the BIS final, much better than in the group. When the dogs are in the spotlight for people so often its hard to get them to be like machines, I dont want that and a big dog needs to move a couple of rounds before they use the legs and angels as good as they can. The Foxterrier Ch Crispy Legacy who is second after Rocky also won the group. Its a beautiful dog and she is a great breeder, owner handler as well. Shows, presenting and breeds dogs year after year that are on the toplists. Very tough!!! I was very very nervous and so sure I was being unplaced. But WE MADE IT!!! More than you can ask for! It was also very touching that so many people came to just watch us in the BIS, thank you! It feels so good for me I want you to know that. Congratulations to Anki Nilsson who has the Thomas daughter that got the CC and got BOS to Rocky, keep up the good work! ← 2xDanish Winner in Herning this weekend. That is great! I think it is something one can never get used to and it is always so exciting!! !